Korean Resource Center (KRC) is a 501(c)(3) non-profit organization. KRC has offices in Los Angeles and Orange County. It is a founding affiliate of the National Korean American Service and Education Consortium (NAKASEC), "a non-profit (501 c3) organization founded to advance a national progressive Korean American agenda." The Korean Resource Center become a HUD-housing counseling agency in July 2010. 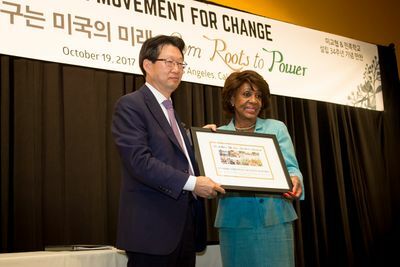 Congresswoman Maxine Waters (CA-43), was awarded the “Standing Up for Justice” recognition by the Korean Resource Center (KRC) and the National Korean American Service and Education Consortium for her commitment to women, children, people of color, and low-income communities during their 34th Annual Gala, October 19, 2017, in Los Angeles. During her acceptance speech, Congresswoman Waters discussed recent actions by the Trump Administration that have targeted immigrant communities, most notably the decision to end the Deferred Action for Childhood Arrivals program (DACA) which could impact more than 800,00 young people -- 200,000 of which live in California -- and upend the stability of nearly 50,000 school-age children living in Los Angeles County that will become eligible for DACA in future years. "The Korean Resource Center and the National Korean American Service and Education Consortium were thrilled to honor Congresswoman Maxine Waters at their Building a Movement for Change Annual Gala on October 19th. Her powerful words were inspiring and clearly moved the audience to want to take action. It was one of the best speeches we have had at our gala in over 34 years," said Becky Belcore, NAKASEC Co-Director. "Congresswoman Maxine Waters is a fierce advocate for the DREAM Act, immigrant rights and all marginalized communities. Her speech energized us for the fight ahead and we are so proud to have her as our Congresswoman and ally," said Dae Joong Yoon, KRC President. in 2007, NAKASEC issued a press release praising Representatives Mike Honda (D – CA) and Lane Evans (D – IL) for passing a "House Resolution Supporting Redress for Former Comfort Women." "(Los Angeles, CA) House Resolution 121, introduced by Representative Mike Honda (D – CA), states that Japan should formally acknowledge, apologize, and accept historical responsibility in a clear and unequivocal manner, refute any claims that the issue of comfort women never occurred, and educate current and future generations “about this horrible crime while following the recommendations of the international community with respect to the ‘comfort women’.” Korean American communities are overjoyed with the news. "In 2001, Representative Lane Evans (D – IL) introduced the first ever resolution to address comfort women redress. Present on that day to announce the bill’s introduction was the late Soon Duck Kim, former comfort woman and a leading spokesperson from the House of Sharing (collective home for former comfort women based in Kwangju, Korea). Since that historic moment, Rep. Lane Evans and later Rep. Mike Honda have tenaciously re-introduced similar resolutions. After six years, H. Res. 121’s passage brings the former comfort women one step closer to justice. "About Comfort Women: During WWII, 300,000 women and girls were systematically raped and tortured by the Japanese military. 80% of the women were from Korea. Only 25% are estimated to have survived. Those who lived were often unable to return home out of shame and have lived a life of severe mental and physical trauma. For decades now former comfort women have shared spoken out demanding justice. But despite growing international pressure, Japan has refused to acknowledge its moral and legal responsibility, even omitting facts about wartime atrocities, including sexual slavery, from school textbooks." This page was last modified on 14 February 2018, at 08:08.